The €250 PokerNews Cup Main Event at King's Casino guarantees a huge €200,000 prize pool. 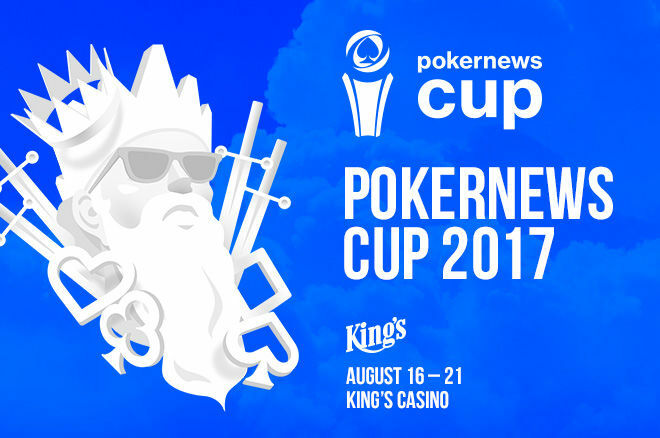 The 2017 PokerNews Cup has arrived, taking place from Aug. 16-21 at King's Casino located on the border of Germany in Rozvadov, Czech Republic. The schedule is full of affordable events and features €255,000 in guaranteed prize pools. The highlight of the festival is, of course, the €250 PokerNews Cup Main Event that guarantees €200,000 in prizes by itself. The festival kicks off on Aug. 16 at 8 p.m. with the one-day €80 PokerNews Cup Opening NLH with an €8,000 guaranteed prize pool. On Aug. 17 the bigger action begins with the first of four opening days of the Main Event. Another opening day takes place on Aug. 18 with two more opening day fields kicking off on Aug. 19. Players in all of the opening fields start off with 30,000 in chips with blinds increasing every 30 minutes. Players can re-enter as many opening days as they wish and re-enter within the same opening day as well. The structure becomes deeper as the tournament progresses. Blinds increase for players that bag chips to Day 2 to 45 minutes in length before they increase to 60 minutes for the final day on Aug. 21. The schedule also features many side events and satellites held in a variety of tournament formats and poker variants ranging from €45 to €230. Of course, King's Casino will also be hosting cash games at low and high limits around the clock throughout the festival. The PokerNews Live Reporting Team will be on hand to cover both the 2017 PokerNews Cup Main Event and the €230 TonyBet OFC Progressive Pineapple, which features a €5,000 guaranteed prize pool. Here is a look at the entire schedule of the 2017 PokerNews Cup.